Do you know about October Unprocessed? Well, Andrew Wilder over at Eating Rules created a challenge – one month of clean eating meaning you cut out processed foods and eat whole, natural, real food. I love real food! I can’t remember the last time I used a packaged product, or something with insane ingredients, to prepare a meal for people I love. The test for October Unprocessed worthiness is simple: if you can reasonably make it in your home kitchen with whole ingredients then you are probably good to go. Now, this is not to say you WOULD make everything because the steps involved are not always practical. The idea is that the ingredients in the products you buy are made from ingredients you would (or could in theory) have in your kitchen. It is a fantastic challenge and last year I learned that many of the ingredients I was baking with were highly refined. I made some simple changes – switching to unbleached and unenriched flour, switching to evaporated cane sugar from sugar that is much more highly refined – that made a surprising flavor impact! This year I made a few more changes that include buying local, pasture raised meat, eggs, and when practical cheese. I am also committed to buying products that are slavery free. It has been an adventure! Last year for October Unprocessed Andrew asked if I would consider a recipe, so I made a truly scrumptious Pumpkin Fondue. 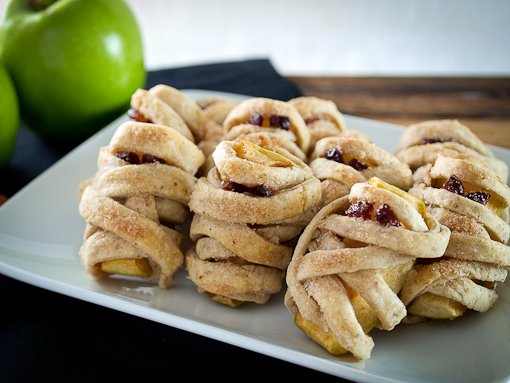 This year I went for something sweet … and a little spooky- Apple Pecan ‘Mummy’ Dumplings! For this recipe tart slices of fresh, crisp apple are lightly dredged in cinnamon sugar, wrapped in terrifyingly delicious pecan pastry bandages, fitted with some sinister cranberry eyes, and baked until tender. 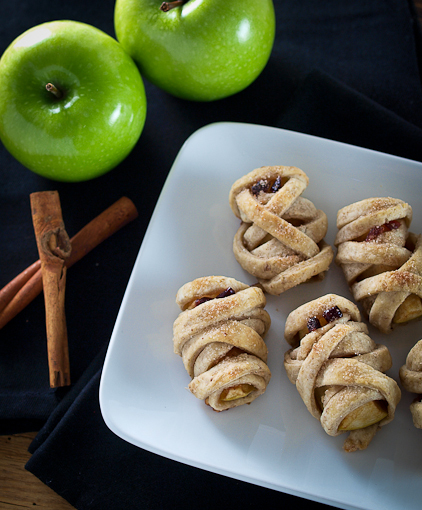 These are a perfect dessert for Halloween, or a great post Trick-or-Treat snack! These are also kid friendly, meaning you can get the little ghouls into the kitchen for a fun project, and for some family bonding! The recipe, and more of my thoughts on baking with kiddos can be found at Eating Rules so please go over there now and check it out along with all the other fantastic guest posts! I hope you all have a scary and fun Halloween!